There are some mornings when you wake up & want more than cereal or eggs. It was Sunday morning & I was thinking pancakes. 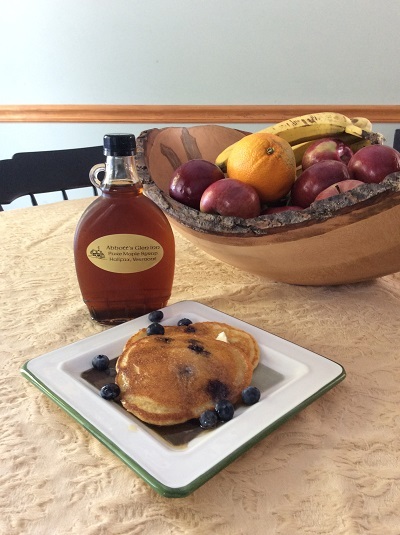 For years, I have made a buttermilk pancake recipe that has become an Inn favorite. In an attempt to make this morning favorite more nutritious, I decided to use melted coconut oil rather than butter. I was out of whole wheat flour so opted for spelt flour rather than white. I had recently purchased some coconut sugar, so decided to add that rather than brown. Tired of apples & pears, our seasonal winter fruit, I added fresh blueberries into my griddle cake batter. They were delicious & light. And no pile of pancakes is complete until you have a cruet of Vermont maple syrup to bath those cakes in. We make our own syrup every March so there is always a bottle on hand for those pancake/waffle mornings. Spelt flour is becoming a more familiar item these days. Spelt is an ancient cereal grain from the Middle east. It is in the wheat family but it is not the same thing as wheat. It has a slightly nutty sweet flavor similar to whole wheat. It is not gluten free. Spelt has fewer calories & is slightly higher in protein than whole wheat flour. Combine 1 egg & buttermilk in a mixing bowl and mix. Add dry to wet. Mix gently. Add vanilla & coconut oil. If batter appears to thick to easily slide off of a spoon onto griddle, add a few more tablespoons of buttermilk. Cook on a greased griddle. Makes 10 medium size cakes. Note: I used coconut oil to grease the griddle. It gives the pancakes a slight coconut flavor. A note about coconut oil. This use to be a no no oil as it was thought to be a bad fat, one of those stick to your artery walls kind. Recently, that information has been proven false. As a matter of fact, coconut oil is a good for you oil with lot’s of other uses. Even the most passionate cook gets a little kitchen weary this time of year. We have all cooked up chiliies, soups, pasta dishes & roasted enough veggies that even a vegetarian would say “no more!” With spring just two weeks away, my thoughts are wandering to the start of gardening season. Here at the Inn we plant a large veggie crop out in our orchard. Several years ago we planted asparagus & strawberries, and reach spring they are our first crop. Tender green asparagus stalks grace our breakfast & dinner plates, roasted or grilled, served with homemade aioli. 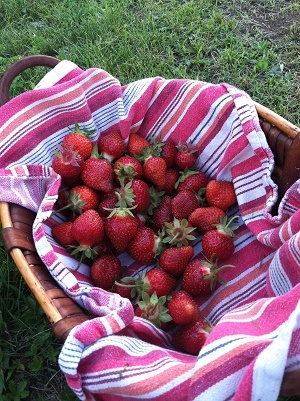 The thought of picking fresh strawberries, sweet smelling from the sun’s warmth, makes my mouth water. I know I am getting a little ahead of myself as I look out the window to meadows still frozen over in several feet of snow. Spring comes slowly to Vermont. We await its arrival, bringing the color & scent of the earth waking up. 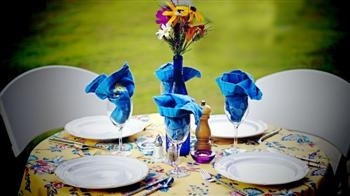 We incorporate the colors of summer into our tables. Here at the inn we begin to think about our summer plans early! 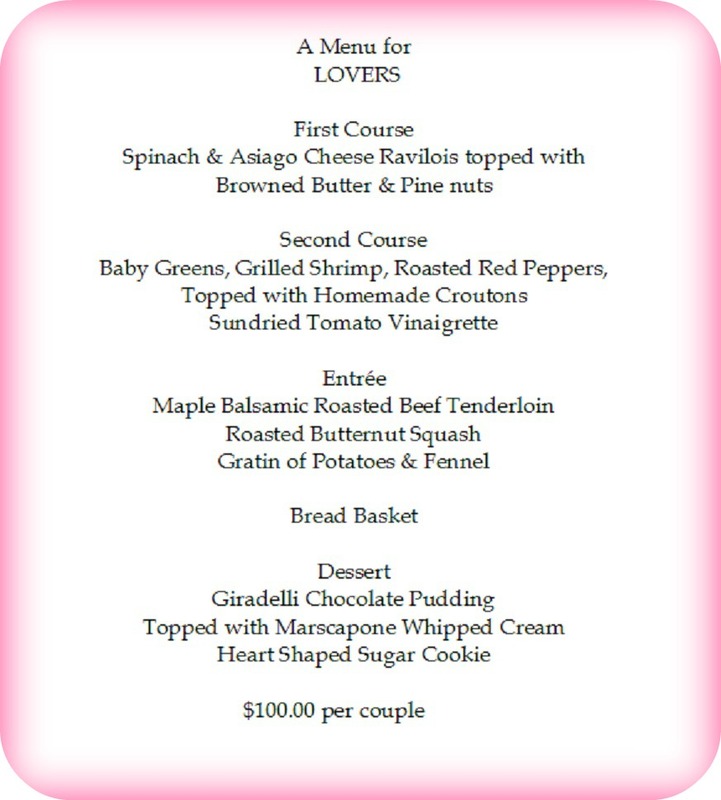 With Valentine’s Day weekend approaching, we compiled a menu sure to delight our guests and kindle their love…for our food! As our dining room only accommodates 18 and we have 22 guests dining, a four course plated meal will be a challenge; but we’re going to grin and bare it!